With Valve unlikely to produce another game in the Left 4 Dead series, many imitators have emerged to attempt to fill that space. Where Warhammer: Vermintide and its recent sequel at least looked to build upon the Left 4 Dead formula with their progression system and fantasy setting, Earthfall simply tries to exist by running around in the skin of Left 4 Dead, expecting different results with what can feel like a bare minimum effort. No matter which way you look at it, Earthfall fails to remain interesting. The 10 available levels lack a single set piece that remains memorable and Its cast of characters fare no better, with character models themselves that feel ripped out of a decade old game. In fact, the entirety of Earthfall just lacks any visual punch and does not measure up to the quality usually expected of a modern release. Textures are bland, bosses clip through walls, environments feel drastically generic and walking through puddles or streams will be met with the sounds of walking on a hard surface. Earthfall shares a release month with another Left 4 Dead-inspired title, the gorgeous Vermintide 2, a title better in every conceivable way. Earthfall does very little to explain its story to you. You'll grasp bits and pieces from the dialogue between the four characters and the lore items you uncover, but frankly, the story here is painfully mediocre. There is some sort of alien invasion via a meteor that crashed down and that's the basics of what we're told. The problem with bread-crumbing your story out via lore items is that the game itself has to be interesting enough to make you want to dive into that lore, and it just isn't. You'll progress through ten mostly-linear missions that take place after the initial alien invasion, via a group of survivors who met up under various circumstances. You'll attempt a supply run by running through an abandoned neighborhood, tracking down transportation at an Auto Repair shop, or battle an almost endless wave of creatures in a train yard as you await your helicopter rescue. While the game does go through somewhat of a checklist for the typical areas you expect in a game like this, you do get to see some of the Earth transformed into a more alien-looking environment, which, I admit, can look pretty cool. The level design regarding its pathing can often be quite good, I just wish the locations themselves were a bit more interesting. Most locations will require that you complete a series of objectives. Most of these are basic commands like powering up a generator, finding fuel, a steering wheel, or activating some sort of switch. "This will attract a swarm" is noted in red above most of these interactive elements and will result in wave upon wave of alien creatures that will flood your location. One of the better ideas, and frankly, probably one of the only actual ideas that this game has is in the use of barricades. You'll grab these portable fences and place them at doorways or when paired alongside other barricades, at large open doors or just open areas in the environment. These fences will allow you to traverse through them but will block any smaller enemies from passing through. Setting up a defendable base before activating most objectives is the smart way to play, but I found that most of the people I was playing with ran through the missions as fast as they could with not a care in the world. Co-op games are generally better with a group of friends and should no one in your friend's list be interested in Earthfall, you can travel along with AI companions that can have their effectiveness increased to be far more helpful. Apart from mowing down endless enemy drones, which actually have some nice designs, Earthfall has a small variety of "special" enemies that are usually mentioned by one of the characters when they are close enough to be a problem. You have the Whiplash, a weird creature that looks like a mutated giraffe that will carry you away by your head until your teammates race back in an effort to save you. There's an exploding enemy called a Sapper that will attempt to charge at you and cover you and the nearby area in a toxic sludge. Continuing the Left 4 Dead trend is the addition of the Thresher, an enemy, much like the Hunter, that will pounce on you from a fair distance away and start to slash at you until you are rescued. And it's not just the Hunter that makes an appearance as the Tank is recreated here as a behemoth called the Beast, albeit with a long distance energy blast. Now, I mentioned in my Vermintide 2 review that many of its special enemies were taken directly from Left 4 Dead and it's unfortunate that both games couldn't have expanded on these creatures and improved or changed upon their archetype, even if yes, the Beast has a projectile blast. Should you see a red pulsing area around you, that means that an Enrager is nearby powering up the enemy drones all around you. This creature is easy enough to take out, but its continued presence can spell doom for you and your companions. The last special creature you'll encounter is the Blackout, and this is actually a fairly interesting foe. It will teleport around you and fire energy projectiles while it has an energy shield around itself protecting it from your attacks. I've read that the game has a spawning system based on how well you and your team are performing, but I just didn't see it as I would jump back into levels again and again and see no real difference. The game offers a fair assortment of weapons that you'll either find laying about or through a 3D printer that you'll encounter when locating a base. This printer will require power and turning that power on will usually result in spawning a horde of alien threats. 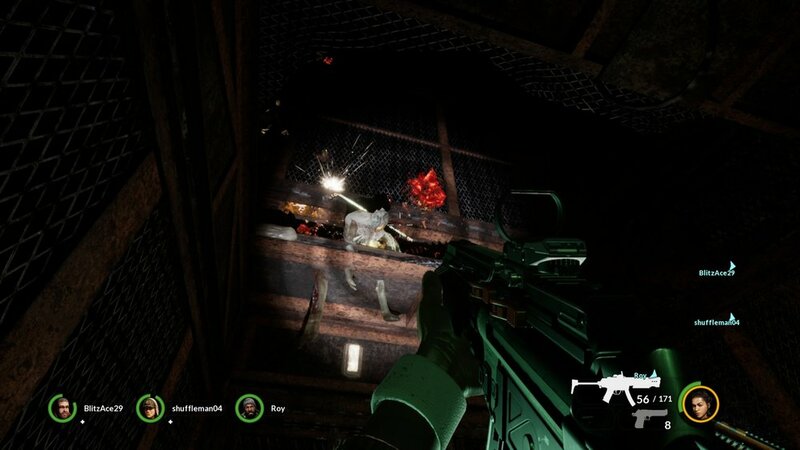 While the 3D printer may seem like an easy way to discover some firepower, Earthfall presents no randomized weapon locations at all, meaning that each and every gun is placed in the same location each time you load into that level, removing any and all tension of possibly being without a weapon for some of the bigger encounters. I also found that the spacing between some ammo crates is wildly different than in other levels and having to rely on a pistol or a melee weapon is not usually that effective. The weapons themselves feel only just 'ok' when firing and feel as if the shooting mechanics were lifted from a much older game. There are a few weapons that I recommend to use like the MP5X or the EF Auto, but to say that any gun feels satisfying to shoot would be overselling it as no weapon grants any sort of tactile response. When you are blasting the alien drones with your preferred gun of choice, you do have to be cautious of your companions as Earthfall does contain friendly fire. I never felt that I was dying that often because of it, but having characters run into YOUR line of fire and then spout off a "Watch your fire!" just felt like more of an annoyance than anything that lent itself to good game design. Matchmaking may have a few more filters that I wish were present in Vermintide 2, but It took considerable effort in Earthfall to even find players to join up with, at least on the Xbox One platform. Out of the few days that I spent with the title, I rarely joined up with a full team, usually having one or two of the characters being controlled by AI. As you can search for specific levels, I usually would have to start a level and either wait for another player to join or launch the game and hope someone would eventually show up. There is also no way to tell the strength of the connection and of the few games that I was able to join up with actual players, the matches either had bouts of considerable lag or the host would disconnect and return us all to the main menu, offering no host changing whatsoever. Holospark has recently announced that they intend to release a form of player progression to the game in the near future and I'm hoping that it will allow the game to stand out and become something more than just another Left 4 Dead clone. I've played through each level more than a few times, jumping behind the 1st person hands of each of the four available characters, and killed each alien creature more times that I probably should have. With the right group of friends, there are certain aspects of this game that can make for a good time, but with so many other options out there from Vermintide 2 to Zombie Army Trilogy, both of which are now available through Xbox Game Pass, there is just no real reason to recommend Earthfall until it sees more content added. Earthfall was purchased by the reviewer.